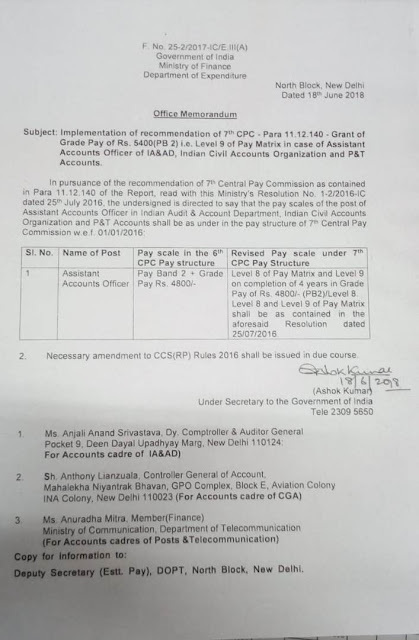 IMPLEMENTATION OF RECOMMENDATION OF 7TH CPC – PARA 11.12.140 – GRANT OF GRADE PAY OF RS. 5400(PB 2) I.E. LEVEL 9 OF PAY MATRIX IN CASE OF ASSISTANT ACCOUNT OFFICER OF IA&AD, I INDIAN CIVIL ACCOUNTS ORGANIZTION AND P&T ACCOUNTS.